See 3D VT link. Extremely rare. A beautiful 1st floor, 3 bed, 3 bath flat style corner villa with long panoramic views overlooking deep water. This hard to find gem offers an open floor plan, fireplace, wood & tile floors, granite countertops, 9 ft ceilings, lots of windows, extended Master Suite w/added sitting area that increased the heated sqft to 1,700, walk-in closet and large bath with whirlpool tub & walk-in shower. Residents in this Shelter Cove gated community enjoy private tennis courts and one of Hilton Head's most picturesque swimming pools looking out over Broad Creek. Steps to the beach from this lovely 3 bedroom, 3 full bath Ocean One Villa. Enjoy first floor convenience and a large patio to relax after a long day at the beach. Used mostly as a second home, this villa is in pristine condition and ready to use! Many recent updates include a renovated kitchen and bathrooms, new HVAC (2016), water heater, tile flooring and much more. Enjoy the oceanfront pool and 2-minute stroll to the shoppes and restaurants at Coligny Plaza. An excellent opportunity and outstanding ocean-side value. Redone in 2014 - in best condition. Lagoon to golf views. 3 Bedroom, 3 bath unit that is all on one floor. 2 bedrooms & 2 baths located in separate cottage. Master bath has a separate walk-in shower. Sitting Room off master. Some features include: granite counter tops, stainless steel appliances, tile floors, smooth painted ceilings, wood plank ceilings. All baths have been redone. 2nd Refrigerator included. Community Pool. No short-term rentals. Back patio furniture conveys with property. Well maintained 2 bedroom, 2 bath Sea Crest Villa with views of the ocean and easy beach access. Amenities include 2 oceanfront pools, indoor resistance pool and fitness center. 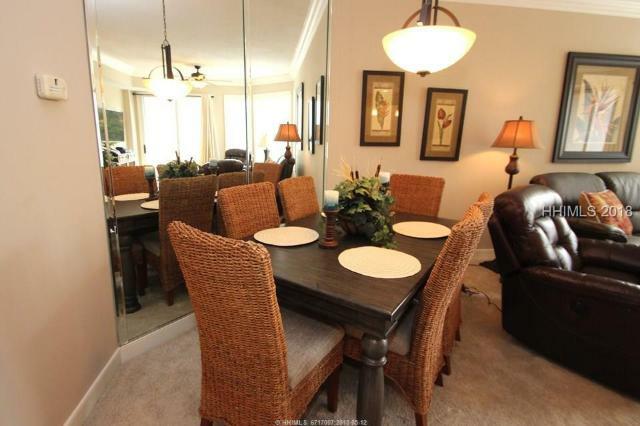 Great rental history and in the heart of Coligny beach! Low maintenance, one-level, open floor plan in the elegant Mansion Flats - Habersham. Inspired by classic architecture, exterior maintenance is covered by the community. First level opportunity comes with 1-car garage, surface parking spaces, separate storage shed, wrap around porch, quality hardscape, and live fence for privacy. 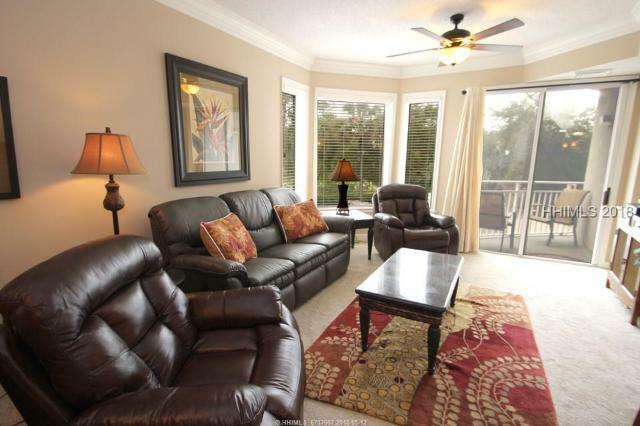 Tall ceilings, quality plantation shutters to adjust light on the oversized windows, and more. Space and storage! One of the bedrooms can be used as study, office, or additional den to master suite that boasts large closets and sleek GÇÿGÇÖhis and hersGÇÖGÇÖ designed bath. 1st floor gem. 2BR, 2BA Sea Crest Villa! Enjoy ocean glimpses. Each BR has a king bed, walk-in closet and bath. Each bath has a walk-in shower, tub & double vanity. Beautiful hardwood floors in living area. Breakfast bar for 2 and a dining room table seating 6. Washer and dryer and 2 lovely balconies. This villa comes beautifully furnished, completely stocked and on rental market. The Sea Crest Villas are across the street from Coligny Plaza, on the beach. 2 outdoor pools, outdoor hot tub, indoor heated spa, indoor resistance pool and a fitness center. What more could you possibly ask for? Only 3 bedroom Heritage Villa available! Come see this fabulous end unit, overlooking Harbour Town tennis courts and just steps to Harbour Town Marina and Golf Links. This is a prime location in the complex! The villas features tumble travertine flooring, updated kitchen and baths and is nicely furnished. Walk to the complex pool. Rental ready! Elegant living at Shelter Cove, moments from the harbour and minutes from the beach. Tradewinds is a small gated enclave of Mediterranean-style townhomes, beautifully landscaped with Palmetto trees, live oaks and tall pines. High ceilings, open floor plan, stunning wood floors, private screen porch & outdoor patio. Beautifully fitted kitchen with granite counter tops & cherry wood cabinets, elevator-ready serving 3 levels. Master bedroom suite, 2 guest suites, abundance of storage space. This is a home away from home on the island whether living full or part time. Turn key ready! Walk to the beach & no need to leave your pup home as Port Villas is pet friendly, beach friendly and boat friendly! Owners dock allows you to keep your boat year round - included in monthly regime fee. Head out the back door and jump right into your boat. Head out the front door to tennis, pool or Tower Beach- private beach for Sea Pines owners. Best part yet- inside has been remodeled so there's nothing for you to do- granite counters, upgraded fixtures, bamboo floors, paver patio, even hinges were replaced. Never rented making it move-in ready! Owner added extra storage throughout and office/3rd bedroom. Perfect for owners OR as a rental. See 3D Virtual Tour link. Beautiful marsh and Broad Creek Vistas Await You! 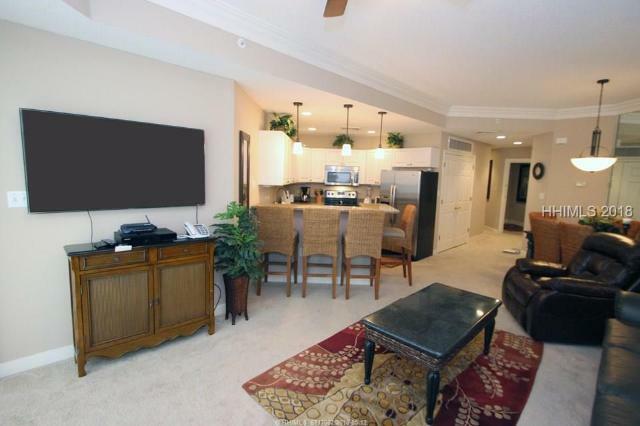 This 4th floor end unit is the largest 2BR, 2BA floor plan offering 3 balconies. Featuring new cabinetry, hickory wood flooring, wainscoting, plantation shutters, brushed nickel hardware, smooth ceilings & decorative lighting. Each bedroom offers a private balcony, updated Jacuzzi in master bath, and guest bathroom has a large walk-in shower. Turn-key ready and comes fully furnished. Never rented. 3rd floor end unit overlooking Harbour and Broad Creek. Spectacular views and lots of natural light. Excellent bedroom separation and 3 balconies make this a must see villa. Shelter Cove owners enjoy all amenities of Palmetto Dunes and easy beach access via the Palmetto Dunes buggy in season. Recently refurbished, light and bright Residents Club unit with great golf view of #10 Sea Pines Country Club within EZ walking distance to Sea Pines Country Club. 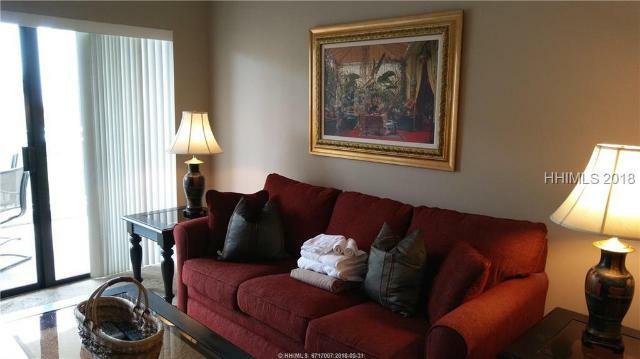 Private 2 bedroom 2 bath flat end unit with granite countertops in kitchen and both bathrooms. Enclosed Carolina/sun room and private deck off master suite. Carport with storage area. Large on-site community pool. Absolutely charming. Premium locale. Rare Old Town corner townhome on Calhoun St in the heart of the Promenade! ItGÇÖs zoned mixed use! Revel in a fun, unique Lowcountry lifestyle just outside your front door and from 3 private balconies overlooking the downtown scene -or- close the door on the action and bask in the solitude of your beautiful designer chic abode -or- enjoy all this ambience as your office space -or- as live/work! 1st floor entry offers clever wine storage across from elevator. New SS appliances, granite counters, shiplap and wood floors grace a sunlit floor plan perfect for entertaining. BR 3/den/office option. Immaculate.